Was walking into dinner last night and happened to glance at RSS sports feed … and saw this shocker: Patrick Corbin signs with the Nats. 6yrs/$140M. And my first reaction was this: wow, the Nats just beat out the frigging New York Yankees for a player. In the FA market, straight up. Wow. Reports from earlier in the day had indicated Corbin was down to just the Yanks and the Nats and I figured, “well, he’s on record saying he has dreamed about playing in New York, oh well.” Then a few hours later he’s wearing a Washington hat. I have a few immediate thoughts on this. Negative and positive. Its not my money, but $23M/year AAV does seem like a lot for a guy who posted a 5.15 ERA just two years ago. Its also a ton of money to commit to a player who really has only performed like a real Ace worthy of this level of financial commitment for one year. That being said, he’s in-arguably the best pitcher on the FA market and the Nats got him. Before the winter meetings even. He’s a lefty too, nicely replacing the near replacement-level we got out of Gio Gonzalez this past year. 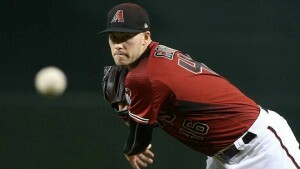 I daresay he might now be the best 3rd starter in the majors. Houston’s rotation is half out the door in FA, Cleveland’s rotation is in the process of getting dismantled this off-season. Its worth mentioning that Corbin has been pitching in one of the better hitter’s park in the majors … and probably will benefit and get a bump in numbers by moving to the NL East and moving to a more neutral park in Nationals park. We get his age 29-34 seasons. That’s not too bad honestly, given what we know about player decline. He’s got less than 1,000 MLB innings on his arm, which is not a ton by age 28. By way of comparison, Max Scherzer had 1,017 MLB innings through his own age 28 season. Corbin is also the kind of guy who seems like he’d age gracefully, in a similar fashion to a guy like Tom Glavine. He doesn’t depend on a ton of velocity (vFA in 2018 of 91.3). Something obviously clicked with him in 2018 because his K rate skyrocketed, his walk rate fell, the value of his slider exploded, and he seemed to add a curve to his repertoire. He’s already had his Tommy John, so that’s nice that he’s gotten that out of the way. Is this yet another Rizzo-to-Arizona connection? Maybe not: he was drafted in 2009 by the Angels, traded to Arizona in 2010 by which time Rizzo was in Washington. Hopefully we’re now completely out of that cynical view of player acquisition from Rizzo’s background. Starters: he’s signed the best available hurler. Relievers: he’s traded for a solid middle-relief RHP and has signed a high-upside former dominant closer to a reasonable contract. Nats roster now at 38/40. Still room on the broom. This move will shred the 2019 draft for this team, costing them their second- and fifth-highest picks (as well as $1 million in international bonus pool money). Poor cap management comes back to bite them. Definitely an “all-in move” throwing draft caution to the wind. They better really hit on that 4th round comp pick (update: well technically if Harper leaves, then that 4th round comp pick would be the 5th highest pick … so it’d instantly disappear like it never got awarded. Just to clarify). Rotation now projected to be Scherzer, Strasburg, Corbin, Ross and Roark. All 5 with guaranteed deals, four of them with 8-figure deals likely for 2019. No room for Erick Fedde here, despite his Winterfest statements. That’s got to be a tough nut to swallow for him, even given the fact that he hasn’t really earned it. But, as we all know teams end up giving starts to 8-9 guys generally, and he’s first in line right now, so he still has hope. But our SP depth is ugly: Fedde, Voth, McGowin, fresh-from-the-Mexican-league Henderson Alvarez, and then whatever MLFA reclamation project we can find in the Jeremy Hellickson ilk. I do think this signing makes it a lot tougher for the Nats to find this role since they really can’t promise that player a non-injury shot at a 5th starter 25-man role. So we’ll be looking at players who will be willing from the go to accept an AAA assignment … and one in Fresno to boot. Any other thoughts? Is this the move that pushes the team back to the top of the NL East and really makes them a contender in 2019? My official take: the Nats bought the best arm they could. This is better than the alternatives they faced this off-season. It only cost them money, not more prospects, and in that respect its a complete win. They’re using the payroll that they earned by virtue of 2018 expiring contracts well. Does this move preclude them now from signing Harper? Well, unless the team plans on trading away Scherzer … it should. Or if the Lerners decide to go Boston-style and really blow out payroll and say “F it completely,” then they still can (and always could). But if i’m Scott Boras i’m kinda shaking in my boots today, knowing that the likelihood of Harper’s baseline pillow 10yr/$300M deal from this team is likely gone. Possible 2013 WBC Nationals participants? I read a quickie piece with some Mike Rizzo quotes from the Washington Time’s beat reporter Amanda Comak on November 11th, 2012 and there was an interesting tidbit at the bottom: per Comak, Rizzo has not been approached yet about any Washington Nationals participation in the WBC, but would approach each request on a “case-by-case basis” to determine what is in the best interests of the team. This got me thinking about possible Nats representatives on 2013 WBC teams. Lets take a quick look at the Nationals representatives on WBC teams from the past, talk about whether its really in the best interests of the team to even let these guys play, and then talk about who may be candidates for the 2013 WBC regardless. (Note: I’ve added updates highlighted in red since the original 11/21/12 publication date on players mentioned here). Ronnie Belliard, Alberto Castillo, and Wily Mo Pena for the Dominican Republic. The tournament was marred for the team by a blown UCL ligament to Ayala, who had undergone elbow surgery earlier in the off-season but pitched for his home country anyway. The team did not want Ayala to participate in the inaugural event, did not want him used by the Mexican team, and team officials were “livid” by the injury, which cost Ayala the season and cost the team its 8th inning setup guy. Ayala recovered to pitch again in 2008 but was never as effective, and was shipped out in 2009 for a PTBNL. Coincidentally, I suspect the team still harbors some ill-will towards Ayala to this day. Meanwhile the other two relievers who participated both experienced regressions in form; Cordero’s ERA nearly doubled (from 1.82 to 3.19) from his breakout 2005 season while Majewski’s numbers dipped slightly before he was traded in the big Cincinnati deal of 2006. Saul Rivera and Ivan Rodriguez playing for Puerto Rico. The WBC seemed to energize particularly Dunn, who enjoyed playing in a post-season atmosphere for the first (and only) time in his career. Nobody suffered any injuries, but Hanrahan in particular may have been affected by his lack of a proper spring training; he posted a 7.71 ERA for the team while losing the closer spot and was shipped to Pittsburgh. Ironically, Rivera also experienced a huge regression of form, going from a 3.96 ERA in 2008 to a 6.10 ERA in 2009 and was eventually released. This begs the question; do we even WANT our pitchers playing on this team? The first two WBCs have shown pretty distinctly that our pitchers have regressed greatly after playing. This only makes sense: the spring training routines are greatly impacted to play in this event. We may see a ton of front-office resistance to specific guys (especially those coming off injury) playing in the 2013 event. Which could affect the eligibility of some specific players for 2013. As you can see, the massive bulk of our team is USA born, and essentially our entire post-season starting roster was USA born as well. That doesn’t necessarily mean that these USA-born players will actually play for team USA (Alex Rodriguez played for Puerto Rico despite being born and raised in Miami, and our own Danny Espinosa is eligible to play for Mexico by virtue of his first-generation born in the US status), but almost all of these guys will be up for consideration for the USA team. And this only accounts for our 40-man players; as we’ll see below there’s plenty of lower-minors players from smaller countries that will participate. Who from the Nationals franchise may make a 2013 WBC roster? First off, thanks to James Wagner‘s 11/15/12 NatsJournal post we already know of three WBC participants; Solano is on the Columbian team, minor leaguer Jimmy Van Ostrand is on the Canadian team, and A-ball catcher Adrian Nieto is on the Spanish team. Curacao qualifies to play with the Netherlands, and I’d guess that Bernadina would make a great choice considering the lack of Dutch players in baseball (Baseball Continuum’s projections agree. And as of 12/4/12 he’s officially been listed as a Netherlands participant).. Venezuela is already qualified for the main draw and has a relatively strong possible team. The Baseball Continuum blog posted an early projection of the Venezuelan team and listed Flores as a likely participant (specifically mentioning that Ramos wasn’t considered due to injury recovery; I’d suspect these two players to switch based on Ramos’ recovery and Flores’ awful 2012). If Henry Rodriguez was healthy i’d guess he would be on that list too, but his season-ending surgery probably precludes his participation. The Dominican Republic has perhaps the strongest depth and has no need for the recently called up Perez among its outfield depth. Maya’s defection eliminates him from discussion for the Cuban team. (12/4/12 update): Chien-Ming Wang has been announced as a member of Chinese Taipei’s team (for the purposes of this article I investigated all 2012 Nats). Which leaves our large contingent of American players. A couple of writers have started postulating on these rosters (David Schoenfield‘s very early guess as to a potential USA roster is here, Baseball Continuum’s latest projection is here). So using these two posts as a starting point, lets go position-by-position and give some thoughts as to who may get some consideration. Keep in mind the WBC rosters are generally very reliever heavy, since no starter is going to be “allowed” to pitch a complete game in March. (Note: I’m still considering our Free Agents as “Nats players” for the purposes of this analysis, since this really goes position by position from our 2012 team to find candidates). Catcher: Kurt Suzuki isn’t nearly in the class of the likes of Buster Posey, Brian McCann, Joe Mauer, or Matt Weiters. There are a ton of quality american backstops right now. First Base: Free Agent Adam LaRoche probably faces far too much competition from the likes of Prince Fielder, Paul Konerko, Adam Dunn, Allen Craig, Eric Hosmer, and Mark Teixeira to make this team. If it were me, I’d go with Fielder and Teixeira. But, LaRoche’s great 2012 season and his Gold Glove recognition may get him a spot. He is a FA though, so i’d guess he won’t commit until he signs and gets the go-ahead from his new team. Or, perhaps he uses the WBC to showcase himself? Not likely needed; he should sign long before the WBC kicks off in March. Second Base: Danny Espinosa is a decent player, but not in the same league as Shoenfield’s projection of Dustin Pedroia and Ben Zobrist. Brandon Phillips is also in the mix for the team. Shortstop: Ian Desmond‘s breakout 2013 season may get him some consideration. There’s not a lot of American quality short stops out there. Troy Tulowitzki is the obvious leading choice (as was Derek Jeter in the first two WBCs), but is he ready to come back from injury? Looking around the majors there are a couple other possibilities (JJ Hardy, Brendan Ryan, Jimmy Rollins and Brandon Crawford all could be alternatives as well). I think Desmond’s combination of offense and defense, combined with Tulowitzki’s injury recovery could get him on the team. Third Base: Ryan Zimmerman cannot break the hegomony of David Wright and Evan Longoria right now, even given Longoria’s injury struggles this season. Chase Headley and David Freese are also in the 3b mix. 12/4/12 update: Apparently Wright is committed, Longoria is out due to injury recovery and Headley “was not asked,” so perhaps Zimmerman is back in the mix. Outfielders: I think Bryce Harper is a natural to make this team, not only on talent but also because of the brand-name recognition (and TV ratings and fan interest) it would generate. Same goes for Mike Trout. Otherwise there’s a slew of top-end american players who can man the outfield and they read like the top of the MVP boards: Braun, Kemp, McCutchen, Stanton, Hamilton, and Granderson are all candidates to make this team. 12/6/12 update: Scott Boras has stated that Harper will skip the WBC to focus on his sophomore season. Starters: The two logical Nats candidates to be considered would be Gio Gonzalez and Stephen Strasburg. But lets be honest; there is no way in hell Strasburg would be allowed to play. Could Gonzalez make this team? Given the depth of American starter talent right now (just off the top of my head: Verlander, Lincecum, Cain, Hamels, Halladay, Kershaw, Lee, Weaver, Sabathia, Medlen, and so on) perhaps this will be a selection of attrition moreso than a selection of availability. So if a number of the older guys on this list beg out, perhaps Gio gets his shot. The WBC’s location in San Francisco has already lead to Ryan Vogelsong committing to play in his home town, and could lead to other Bay Area players signing up. I’m not sure any of the rest of our starters are really candidates, given the reputations of the above list plus the reliever-heavy nature of the roster. Relievers: our two most well known relievers (Tyler Clippard and Drew Storen) are possibilities; would the Nats block Storen based on his 2012 injury? Craig Stammen‘s breakout 2012 season could get him looks, based on the reliever-heavy needs of the team. Normally Sean Burnett may be in the loogy mix, but there’s better lefty relievers out there AND Burnett’s FA status may lead him to bow out to curry favor to his new team (Schoenfeld lists Burnett as a possible member back in July, before knowing he’s declared free agency). The question is, would you take Clippard/Storen against the likes of this list of quality american back-of-the-bullpen arms: Kimbrel, Ventors, Marshall, League, Janssen, Papelbon, Hanrahan, Motte, Boggs, Bailey, Reed, and Nathan? Possibly, considering that a lot of these guys probably bow out. We’ve sent multiple relievers to each of the past two WBCs and its likely going to be the same thing this year. USA: Harper, Desmond, Gonzalez, Clippard. Perhaps Zimmerman and Stammen. March 2013 update: here’s the post-WBC actual list of participants when all was said and done, helped by the list of rosters via Wikipedia. MLB reports that nine (9) Nationals are participating in the classic, though the below list (excluding Wang) totals more. They’re not counting Solano/Columbia, having lost in the preliminaries. Bill Ladson’s inbox, 11/7/11 edition. Here’s the latest Bill Ladson inbox, 11/7/11 edition. Q: Knowing how much you praise Danny Espinosa’s defense, I’m sure you think he should have won the Gold Glove Award. But he made more errors than Brandon Phillips and his fielding percentage was lower. Do you really think Espinosa deserved it? A: Espinosa didn’t “deserve” the Gold Glove for two reasons. 1) He’s too young to really register in the minds of the voters of this award (supposedly Managers but often delegated to a minion) just yet, as the Gold Glove in some ways is an award of “reputation” rather than accomplishment. 2) Espinosa is no where near the best defensive 2nd baseman in the NL. Brandon Phillips is a pretty good selection but himself isn’t the best NL 2nd-baseman using UZR/150 as a measure. Chase Utley was the best in 2011 and has been the best defensive 2nd baseman in the NL for a while now. Espinosa’s 0.9 uzr/150 for the 2011 season puts him barely at league average. Ladson says that Espinosa has more range than Phillips and deserves more credit. A quick look at the UZR link above does show something interesting, in response to Ladson’s comment. His “OOZ” (out of Zone, or balls hit out of his normal fielding zone) count of 51 for the year far eclipses either Phillips or Utley, meaning that Espinosa is making a ton of plays on balls a normal fielder wouldn’t get to. However his “RZR” (Revised Zone Rating, basically a percentage of balls IN the zone that are converted to outs) is significantly lower than Utley. What does this mean? It means Espinosa is making a ton of high-light plays (things that stick into the mind of beat reporters like Ladson who see him day in and day out) but is missing a bunch of plays that he should be making, in comparison to someone like Utley. My guess is that Espinosa is really still learning the positioning of 2nd base and will see this rise as he gets more comfortable in the position. Q: If the Nats are serious about being contenders next season, they need to open up the piggy bank. They need to pick up left-hander C.J. Wilson. What do you think? A: Are the Nats going to be contenders? Or is 2012 just one more year in the “master plan” that we’ve heard so much about? Because if you don’t follow “the plan,” then suddenly you’re the NY Mets with a bunch of expensive and under-performing FAs. The Nats don’t seem to have an owner ready to jump payroll into the $125-$150M range (if you noticed, our payroll has been almost identical year to year since the Lerners took over, right in the mid $60M range), so that means the team needs to focus on building from within, through the draft, keeping payroll low by using more min-salary guys and not depending on the FA market to build. In that context, I think Wilson is not worth pursuing. I also believe that Wilson is not nearly the “ace starter” that he’s being made out to be (at best, he’s a #2 starter but showed significant holes in his game this past off-season). Is that level of a pitcher going to be worth the $80M contract he’s going to command in a pitcher-weak market? To me, the answer is no. I’d rather work a trade and cash in some prospects to get someone under club control (trading for pitchers from Tampa Bay, Atlanta or Oakland), or wait til 2012 when the FA crop is better. Ladson says the team “scouted” Wilson but won’t sign him; Rizzo wants an innings eater. That sounds like Mark Buehrle to me frankly. But that’s a topic for another blog post. Q: What if the Nats fail to land Wilson, Mark Buehrle or Roy Oswalt? Do you think Rizzo would have any interest in right-hander Edwin Jackson? I realize Jackson’s performance has been erratic year to year, but he has proven to be durable, plus he’s only 28 years old and has loads of playoff experience. A: I predicted previously that the Nats would sign Edwin Jackson and not one of these other candidates this off-season. Yes Rizzo has said he wants an innings eater (that would seem to indicate Buehrle), or a veteran presence (Oswalt), or a “top of the rotation” starter (Wilson), but each of these candidates has potential issues. Wilson may not be worth the money, Oswalt may be too injury prone and home-sick for the deep south, and Buehrle not enough of a power-arm (not to mention asking yourself why he’d want to leave Chicago at this point?). But Rizzo scouted and signed Jackson, likes his power arm, and he could be a decent alternative to the question marks we’d have at the back-end of the rotation. Ladson points out what I didn’t; that Jackson is erratic and isn’t that good a pitcher. I agree; but the answer to the questions “should we sign Jackson” and “do I think we’ll sign Jackson” seem to be different for this team. Q: Please tell me catcher Ivan Rodriguez will be back with the Nats next season. He is a class act and is so close to career hit No. 3,000. Any chance the club re-signs him? A: Why would this team possibly want or need Rodriguez in 2012? There’s a difference between sentimentality (all the points made here) and reality of production. Rodriguez was *awful* in 2012, he’s getting to the point where he’s clearly just hanging around to reach a milestone, and while I don’t think he’s jeopardizing his legacy, there may eventually be comparisons to other vets (Willie Mays) who hung around one season too long. Now, I’m writing this assuming that Wilson Ramos is returned safely, and with the plan of going into 2012 with both Ramos and Jesus Flores installed as 1-2 in the catching depth charts. Personally I believe the eventual move for the Nats will be to trade Flores, bring up Norris and then use those two players going forward. Ladson says its 50% that the team brings him back. Why?? How does Pudge fit into Ramos-Flores without an injury or an off-the-field issue? Ladson also says Pudge didn’t get at-bats b/c of injury. Uh, seemed to me he was healthy most of the 2nd half. He didn’t get at-bats because he had a god-awful 66 OPS+ in the at-bats he DID get. Q: What is the status of Corey Brown? Will he be ready to compete for a job come Spring Training? If Jayson Werth is moved to center field next year, who would play right field for the Nats? A: I don’t think Brown is going to pan out at all, frankly. He hit .235 for the year in his 2nd year (first full time though) in AAA. He had one good month, hitting .351 for August, but the rest of his monthly splits were pretty consistently weak. If Werth plays some center, we could put someone like Laynce Nix in right (where he did play a bit in September). But that’s not ideal. Maybe the team just bites the bullet and plays Bryce Harper in the OF from day one of 2012 (doubtful b/c of super-2 status concerns, but Davey Johnson does have a history of playing very young rookies). More likely the team signs another stop-gap CF option, signs a 4th outfielder and waits to see if Harper earns a call-up in June. Ladson more or less agrees with what I said here. Q: With center field being a concern, should the Nationals look at Juan Pierre? A: No, on so many levels. Pierre didn’t actually play CF this year (and hasn’t since 2009), he’s on the wrong side of 30, he’s clearly slowing down (he had half the steals this year compared to last), he’s got a horribly weak arm, and he can’t hit (80 ops+ for 2011). Ladson concurs.